Yes, you may be able to blame your divorce on Jim and Pam. Staying on good terms with your significant other can take a tremendous amount of work, and according to a new study, getting too invested in TV show characters might make your relationship much more unstable. 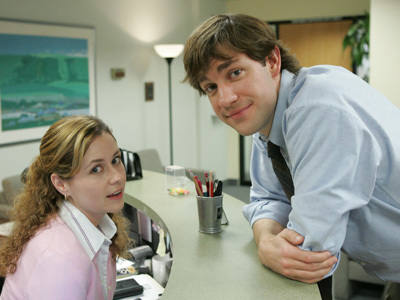 Research from Albion College suggests that if you follow the romantic exploits of TV sweethearts like The Office’s Jim and Pam, you’ll take less of an active role in your own relationship, inevitably leading to some strife between you and your partner. The article’s author, Dr. Jeremy Osborn, believes that people raise their expectations of what constitutes a health relationship as a result of the unrealistic standards projected by many TV characters. Many people subsequently believe that they have better alternatives to their current partners and spend less time working on keeping their relationships healthy. Osborn surveyed more than 390 married couples and asked them to describe their current romantic relationships, their overall commitment to their partners and their expectations of healthy relationships. He also asked about television portrayals of romances and discussed viewing habits. Participants were also asked to assign a cost to their relationships based on a number of factors including loss of free time and loss of personal freedom. According to the study, individuals who believe that on-screen relationships are realistic have a higher chance of assigning a high cost to their relationships. In other words, they believe that they needed to work harder to attain a healthy relationship than individuals who do not assign realism to TV romantic relationships. Osborn believes that TV viewing play an enormous role in viewers’ relationships. “The rate of marriage failure in the U. S. is not dropping, and it is important for people to have a sense of what factors are leading to the failure of so many relationships,” Osborn said. Frequent TV viewers were more likely to believe that onscreen romances were realistic. Osborn says that the big problem is that TV viewers are often unaware of the role that dramatic portrayals of relationships play in their everyday lives. The study will appear in the September 2012 edition of the communications journal Mass Communication and Society.